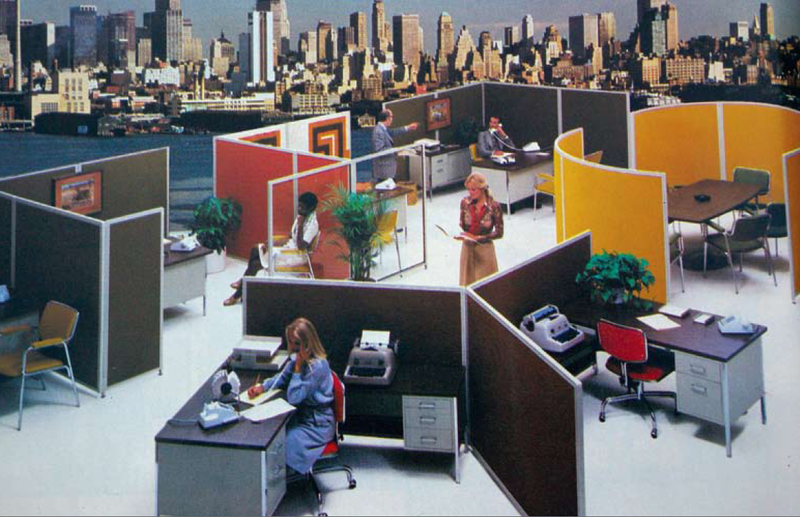 Italian company Arper had a great idea: Create a line of elegant cubicles to divide the hell that is the open office. They look really cool–but wait, haven’t we seen this before? Ah, yes. It seems Arper got a plutonium-powered Fiat 600 time machine and went back to the past for inspiration–a reedition of the cubicles that were used in the ’60s to end with the open plan offices and bullpens of the ’50s, demonstrating once again that we live in a cycle of creation and destruction. We will never learn. Still, they look quite pretty, with curved forms and luscious colors. The company launched the line–called Paravan— this week at the Orgatec furniture fair in Cologne, Germany. Arper claims that each cubicle is made with panels that absorb sound, embedded in fabric. The cubicles are modular, so you can organize your own spaces. Add a few 1958 Egg chairs by Arne Jacobsen and a couple of Eero Arnie 1963 Ball Chairs here and there, and your ad agency will be in business in no time, Mr. Draper.